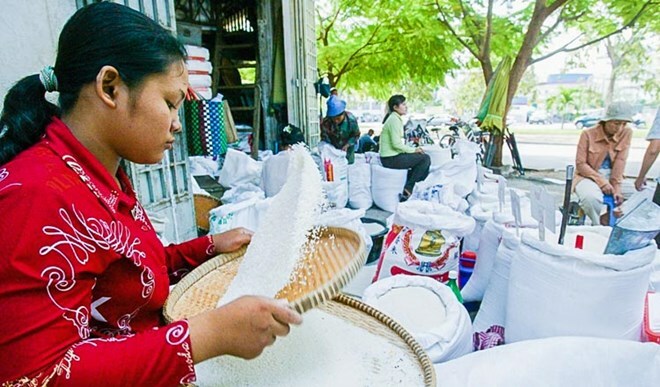 Hanoi (VNA) – Bangladesh signed a memorandum of understanding (MoU) with Cambodia on August 2 to buy 1 million tonnes of rice within the next five years. Cambodia's Commerce Minister Pan Sorasak revealed the information after signing the deal with Bangladeshi Food Minister Kamrul Islam in Phnom Penh. Under the agreement, Bangladesh will purchase 200,000 tonnes of white rice and 50,000 parboiled rice from Cambodia this year, he said, adding that his country will be able to export rice to Bangladesh this October. Bangladesh, the world's fourth-biggest rice producer, has become a major importer of the grain this year after flash floods in April hit domestic output. Cambodia said this is their biggest rice export deal, and also plans to renew a MoU with Indonesia as well. "We want to push for a 1-million-tonne deal with Indonesia," said Cambodian Commerce Ministry Spokeswoman Soeng Sophary. Cambodia exported 288,562 tonnes of rice in the first six months of this year, an increase of 7.6 percent compared to the same period last year.